Mission: To provide services and materials that promote independent functioning for blind and visually impaired persons.. Eligibility requirements: Legal blindness or severe visual impairment. Ages served: 0 and above. Facility Accessibility: Completely accessible. Transportation available to and from facility. Funded by: Lions Clubs, Public Funds, State Funds, United Way, Private Donations, Endowments. # of Staff: 4.5 FTE. Fee structure: No charge for services. See descriptions for the following services: Community Outreach Programs; Daily Living Skills/Independent Living Skills Training; Travel/Orientation and Mobility; Low Vision Services; Recreation Services; Information and Referral; Counseling; Computer Training/Assistive Technology. Offers comprehensive vision screening for elderly people in the community. Offers training in the use of CCTVs. Offers counseling/social work services, social casework, advocacy, outreach, visitation. Provides training in Personal Management,Independent Living Skills, Activities of Daily Living and Orientation and Mobility/Travel Training for Ages 18 and Up.Offers independent living services and community-based programs for elderly people. Offers Adaptive Living Program. Offers public education programs on blindness and vision loss. Maintains a monthly low vision clinic. Provides comprehensive vision screening for elderly people. Low vision specialist prescribes low vision devices. Offers community-based programs for elderly. Provides instruction and equipment for Travel Training/Orientation and Mobility in the Community (Home Environment and Work Environment). 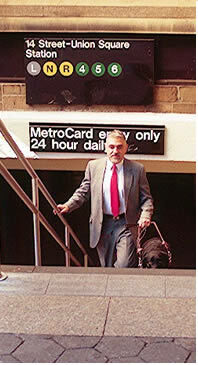 VISIONS Blindline® partially funded by the New York City Council. Policy Statement | Copyright © 2019 American Foundation for the Blind. All rights reserved.